I doubt there are many fly fishermen who pass up the opportunity to try out something new, something that might improve their chances of catching fish. That ‘something’ could simply be a new piece of gear, one that will send the fly farther or more accurately to its target. Or, perhaps it’s some new understanding about our quarry: where they may be at a particular time of day, what they might be doing under a particular set off conditions, how they might be locating and catching their prey. One of our favorite debates revolves around how fish view their world, and more words have been written in the fly fishing literature on this subject than perhaps any other. Clearly, whatever other factors may influence our decisions, knowing at least the basics of a trout’s visual ability is helpful. And in fact we know quite a lot. For instance, we know they can see color—pretty well actually and across a color range similar to our own. That doesn’t stop us wondering how important color is to the trout and how that might affect our fly design. From that fascination comes a question that has become the focus of much popular conjecture: Can trout see more? Can they see a “world invisible to man,” a world illuminated by ultraviolet wavelengths? It’s a salutary point because in the last few years ultraviolet vision has had a niche carved out for it in the fly fishing world. A book espousing its importance has been written (excerpted here on Midcurrent), the subject regularly appears on forum and blogs, and some retailers now offer ultraviolet-reflective materials for the fly tier. Despite this apparent acceptance, the importance of ultraviolet vision in a trout’s life has not gone unquestioned. So it’s probably worth having a careful look at our own homegrown attempt to imbue trout with this secret visual power—especially in the light of the less than sure-footed claims made by some hunters. In vision, simply put, color perception is determined by two things: which wavelengths of light actually get through the initial barriers of the eye to fall on the retina, and then what range of color-interpreting cells the retina contains. To get to the retina, light passes through the cornea, the anterior cavity containing aqueous fluid, the lens and then another cavity containing a thicker fluid called the vitreous body. In some animals these barriers allow pretty much all the available light through. In others, like us, pigments in one or more of these barriers, or the structure of the barrier itself, can selectively limit the wavelengths that reach the eye. Whatever light gets through to the retina then falls on two types of retinal cells, the cone and the rod cells. Cone cells do the daytime job of color vision and they are classified by the pigment they contain (a protein called opsin) and the wavelength of light to which these pigments maximally respond. For us, our Red-Green-Blue vision is created by a set of cone cells containing opsin, which is maximally responsive to long wavelengths in the red part of the spectrum (LWS cones); a set sensitive to medium wavelengths in the green part (MWS cones); and those sensitive to short wavelengths in the blue part of the spectrum (SWS cones). It is the combined input from cones containing different visual pigments, responsive to different wavelengths, which allows animals to perceive color. A simple schematic showing retinal sensitivity of four cone types responding to wavelengths in the red (LWS cones), green (MWS cones), blue (SWS cones) and ultraviolet (UVS cones) parts of the spectrum. Our RGB color vision makes us “trichromatic,” meaning we have cones sensitive to three different colors. “Dichromatic” then obviously means sensitivity to two colors, and “tetrachromatic” sensitivity to four. 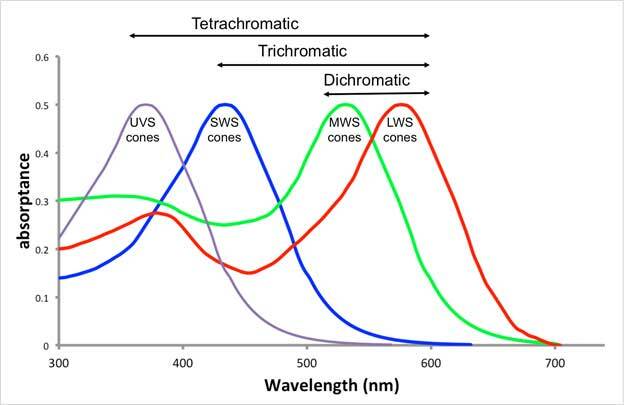 Tetrachromacy is usually achieved by adding a fourth cone type that responds to even shorter wavelengths, those in the ultraviolet portion of the spectrum below about 400 nm (UVS cones). The rod cells come into play during low light conditions. As dusk falls the cones and rods share the job of vision for a while (this is the dark adaptation period) and then once the sun is down the rods do all the work. They too have an opsin pigment, this one maximally responsive in the green part of the spectrum. It can be stimulated during dusk and dawn. But since color vision requires the interaction of two different opsin types at the same time, and as the cone cells shut down after dark leaving the rod cells on their own, trout, like us, are color blind at night. There’s much more to all this of course (and if you really want to boggle your mind look up how mantis shrimps see the world), but for our purposes the basic description above is sufficient for the discussion below. Evidence for animals seeing ultraviolet was first discovered back in 1882, when ants were shown to respond to these short wavelengths. One hundred years later the first fish species was quietly added to the ultraviolet list. A short paper briefly suggested that roach—a European member of the carp family and a very popular angling target—were receptive. In the same year a bigger splash was made by a study on the Japanese dace (rather endearingly known as the “ugui”) published in the prestigious journal Nature, showing it too could see ultraviolet. And a few years later still we get to the object of our interest when in 1987 James Bowmaker and Yvette Kunz demonstrated that brown trout were ultraviolet sensitive. One wonders immediately what this additional color channel might be good for. Is it used to assess the health or social status of others? Does it help them navigate their world? Is it employed to locate, identify and catch food? Sensitivity to ultraviolet light may be useful for all of these purposes, but of course how it helps trout locate their food is what anglers are really interested in. Fortunately a number of researchers have also been interested in these questions. They’ve established that many zooplankton, like Daphnia, absorb ultraviolet and so might stand out more to an ultraviolet-sensitive predator. Initial studies on a number of species, including trout, were equivocal, some showing that being able to see ultraviolet aided in prey capture, and some showing it didn’t. It wasn’t until a couple of years ago that Professor Novales Flamarique carefully designed and conducted an experiment on trout (young rainbows in this case) to get to the bottom of it. He showed quite conclusively that the trout with ultraviolet cones could locate their zooplankton prey at greater distances, and across a greater field of vision, than the trout that didn’t have the specific UVS cones. It turns out that trout and salmon do not maintain their population of ultraviolet-sensitive cones throughout their lifetime. Though the extent of UVS cone loss was the subject of a scientific spat a few years ago, the consensus now is that UVS cones are lost and replaced by blue-sensitive cones when the fish smolts—the process that prepares the fish for downstream migration and a period of life at sea. Resident trout go through a similar process, losing their ultraviolet cones, but don’t head for the ocean. A small number of the UVS cones may remain in the upper retina but are unlikely to be of any use for prey location. These cones would primarily respond to light coming from below—not the direction trout tend to focus on to find prey. No dedicated population of ultraviolet specific cones then. Yet lately it’s been suggested that trout don’t actually need UVS cones. They can see ultraviolet using a secondary peak in sensitivity of cones maximally tuned to longer wavelengths. This secondary peak is called the beta-band or cis-peak. Have a look at this figure. Retinal sensitivity of an adult rainbow trout. 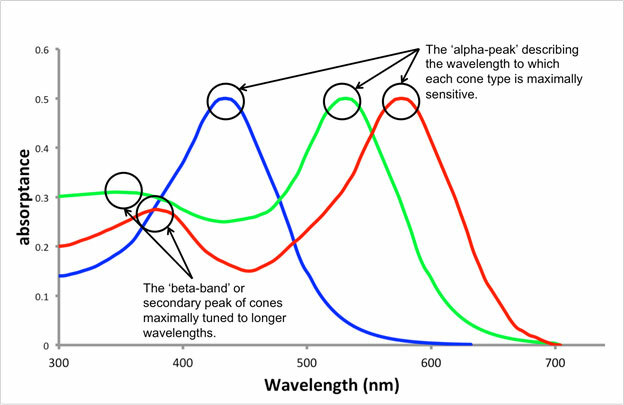 The beta-band shows a secondary level of sensitivity in the ultraviolet portion of the spectrum as shown. But note, these trout have had their cornea, lens and other ocular media removed. The light is shone directly on the retinal cells free of any blocking pigments and so represents the theoretical sensitivity rather than the actual sensitivity. 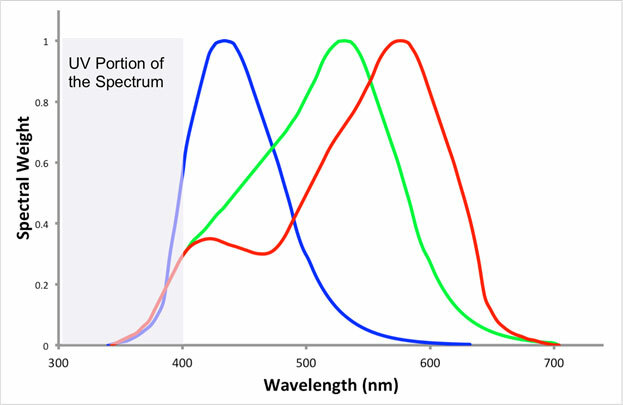 According to this conjecture, the beta-band shown in the figure above allows trout to see ultraviolet and see it especially well in the evening and early morning (when short wavelengths are more prevalent) as well as at night when rod cells take over the visual job. Some of this is demonstrably true. There is more ultraviolet around at dawn and dusk, and there are a few animals known to use the beta-band. There is a bat for example, that uses it in the evening to locate flowering plants. And mackerel might view each other with the help of the beta-band to help maintain shoal cohesion—their vivid stripes apparently reflect ultraviolet. But these appear to be exceptions to a general rule. More commonly the beta-band is something of a problem for vision. 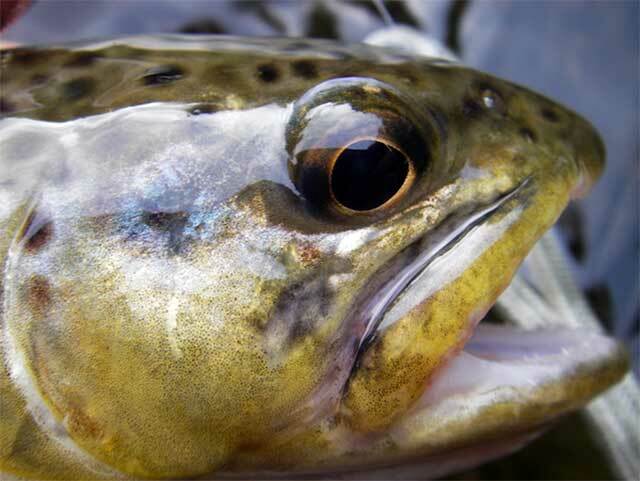 For trout this secondary peak only provides between a third and a quarter of the sensitivity they had when their young eyes were full of specific UVS cones. The beta-band is also problematic because short wavelengths get in the way of acute vision. This is especially true in the ultraviolet range as there is an exponential decline in acuity as wavelength decreases. It is one of the reasons we restrict the number of blue cones (which, though longer than ultraviolet, are still at the shorter end of the spectrum) from the area of our eye, the fovea, we use for our most acute vision. Additionally, ultraviolet is easily scattered across the retina, making it difficult to focus at anything but the shortest range. And the wavelength causes chromatic aberration (when the lens can’t focus color to the same convergence point) as well as reducing color constancy—an attribute that ensures an object remains the same color under different levels of illumination. All of these effects become more pronounced as the trout ages and the eye grows larger. Trout deal with this by increasing the amount of pigment in their lens restricting the amount of ultraviolet reaching their retinas. Gerald Jacobs, long-term researcher on animal vision, points out that for brown trout, “the 50% transmission curve progresses from about 310 to 390 nm over the first three years of life.” The cutoff for ultraviolet vision is at about 400 nm so there really isn’t much wiggle room for a trout’s visual ability in this wavelength. And this includes being able to see it at night too. Aside from all the above factors restricting short wavelength penetration to the retina, there also happens to be very little ultraviolet light at night anyway. One research paper even goes so far as to say “there is no ultraviolet after dark”. Taking all this into account researchers have modeled what light gets through to the retina of an adult rainbow trout. As you can see from the figure below, their estimates suggest that a rainbow doesn’t see much in the ultraviolet region. Estimated color perception of an adult rainbow trout (the same one as in the figure above) after retinal sensitivities have been corrected for the UV transmissibility of the lens and solar irradiance. Not much gets through in the ultraviolet region of the spectrum. Now I suppose it might be possible to squint at this summary and still suggest ways adult trout use ultraviolet. But even then there is another aspect to consider. What about the trout’s prey? Shouldn’t a grown-up trout’s food interact with ultraviolet in a way that makes them easier to detect, just like the zooplankton prey of young trout? After all, even the best ultraviolet receiver needs to see a signal. John Acorn regularly uses ultraviolet photography in his work as an entomologist. One of the areas he finds the technique useful is in helping to distinguish between species of Colias butterflies. They look very similar under visible light but are easily told apart under ultraviolet. Acorn is also a fly fisherman, and since fly fishing entomologists are knowledgeable folk his local fly fishing club asked him to give a talk on ultraviolet vision. Before the talk, he turned his skill at ultraviolet photography to taking pictures of trout food—mayflies, caddis flies and the like. Then, having given his talk he wrote an article on the topic for the journal, American Entomologist. He found that ultraviolet photographs of trout food looked “pretty much exactly the same as any other black and white photographs of the same subject.” He also went on to say that this was not surprising: “… trout food insects just simply don’t possess strong UV-reflectance patterns, and that trout are not likely to identify their food by looking for UV reflectance”. It’s now known that many fish (goldfish, carp, roach, rudd, bluegills, bass and more) possess ultraviolet sensitive cones when young but lose them when they get older and larger. In general, young (or small) fish feeding on zooplankton benefit from having ultraviolet vision, whereas older, larger fish, foraging on opaque macroinvertebrates and smaller fish don’t. The food items of these older fish don’t usually convey an ultraviolet signal. Ultraviolet light is an important component of vision for some animals and an interesting topic, not least because we can’t see these wavelengths and often think there is something special about animals that can. But for fly fishers, there seems to be no reason to elevate this trait to any significant status. For trout and a number of other species we target, ultraviolet-sensitive vision does not seem to be a component of the adult fish’s behavior, and it is especially unlikely to be an important part of the way they locate and identify their food.